Broadcast on Channel 5 (UK) 08 May 1997 Thurs 4:40 a.m.
Connie is seen briefly in the laundry but doesn't seem to have any dialogue (unlike Wanda when she is playing cards with Lizzie and Doreen). I don't think the Sister appears in this episode either. Monica tells Clara she's taking over the "business" of supplying grog (in front of the officer supervising the shower block). Clara says it couldn't be Noeline who stole the grog as she saw her being taken to the infirmary, and she worries that Greg will realise why she was so ill. Lynn and Karen are just about to leave from reception when Erica cancels their work and study release when they won't lag and say who made the booze. Val warns Bea not to get too involved in the troubles of the girl next door. Noeline refuses to accept the tranquillisers prescribed by Greg. When the police arrive, Bea lies to protect Val and tells the detective that she just turned up that morning and demanded help. Yvonne takes the hint and backs her up. Clara takes all the blame for the home brew, so the work and study release can go ahead. Karen refuses a lift from Steve to University, as she wants to prove she can do it herself. Erica gives Clara a roasting for producing the grog, as it contributed to the trouble at the siege and sends her to solitary. Bea is brought back to Wentworth, but surprisingly it seems to be accepted that she will put straight back in her dormitory, rather than put in solitary. Doreen is on cleaning duty in the shower block, so is the first to welcome Bea back. Doreen passes the news on to the women in the laundry, but Monica says Bea can't just assume she will just walk into her old position again. Greg takes out Bea's stitches, under protest. Bea sees off a challenge from Noeline and takes back the press from Monica. Monica tries to put pressure on Lynn to get stuff for her, but Bea steps in saying that nothing must happen to endanger the work release program. Noeline, Bea and Karen are now sharing a cell and the situation looks likely to explode at any moment. Vera goes for dinner at Meg's flat and Vera clumsily asks her if she likes living alone: she is obviously still missing George. Noeline waits until Bea is asleep then walks overto her bed and punches her, but Noeline wakes up herself next morning with even more bruises. Karen and Bea are taken to the Governor, but Bea claims responsibility for the attack on Noeline. Erica and Vera discuss the options for moving the women around to avoid potential conflicts. Doreen visits Clara in solitary to ask for help: Clara advises Doreen to stay out of the conflict between Monica and Bea. Bea walks into the laundry to find Monica on the press. Monica refuses to give the press over so they fight and Meg is knocked unconscious trying to break up the fight. After a dressing down from Erica, and the threat that she will lose her parole, Monica seems to accept Bea's claim to be top dog. Greg looks after Meg in the infirmary and has a misty edged flashback indicating he is starting to look on her romantically. Meanwhile, Steve goes to find Karen on the University campus and they talk about her relationship with Greg. He confesses he is becoming involved with her, but she tells him she isn't ready to return his feelings. Lynn is moved into a cell with Doreen and Lizzie, so Noeline can be moved into a cell on their own. 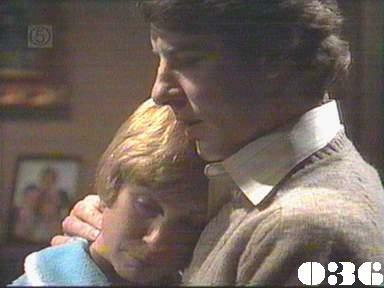 Greg looks after Meg at home: Meg thinks she is more shaken up because it reminds her of Bill's death. Vera also drops in on Meg and is back to her old self, gloating about the punishments she gave Bea and Monica. Doreen and Lizzie want Clara to stand up to both Bea and Monica. After Vera leaves, Greg and Meg get more intimate and he offers to stay the night with her.